One reason I started slow cooking meals was to keep track of my diet. Two years ago, my doctor told me I have super high blood pressure. That’s not the kind of news you want to hear at the age of 35. It was then that I began to pay attention to what I was eating. Most of my slow cooker meals at home are healthy. For example, later this week I plan on making Sloppy Joes. That’s not what you think of when you are going for healthy, but I found a recipe in which you make your own sauce. It also includes ground turkey and quinoa. While deciding this month’s recipe for The Monitor, I realized my previous endeavors were of the unhealthy variety. Garlic mashed potatoes and pizza dip taste great but aren’t good for your waistline. 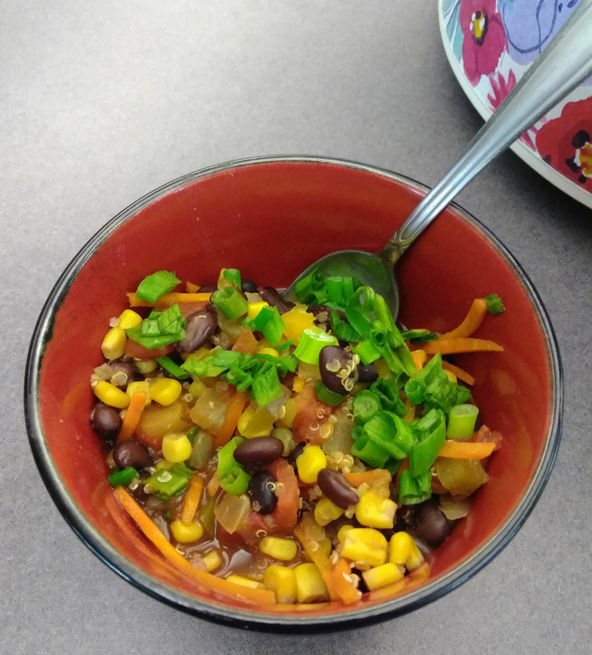 This month, I found a vegan-friendly chili from jessicainthekitchen.com. It’s a great alternative to a popular comfort food. You should incorporate healthy vegan dishes into your diet. Many of them include a healthy dose of vegetables you need. They can also be filling and tasty. That is exactly the case for this chili, which is easy to make and is packed with protein and fiber. It is also only 247 calories per serving. There are no meat alternatives in this recipe but there are quinoa and black beans to help fill you up. The prep time is only 10 minutes and the chili will cook in three hours. If you are vegan, an option for the slow cooker is to make a vegan sour cream for your toppings. For you non-vegans, toppings such as sour cream and cheese are great but that will make the recipe less healthy. Try the recipe, and let me know what you think. Combine all of the ingredients in the slow cooker and stir a few times. Cook on high for 2 1/2 hours. If you want less liquid, cook on high for three hours.